Keep your iron fence in great shape by using these maintenance tips. Whether your iron fence is brand new and you are looking to keep it in beautiful shape, or your iron fence has seen better days but is still hanging on, keeping it strong is essential to letting it do its purpose—protecting your home! Here are some of our best maintenance tips to keep your iron fence strong and sturdy throughout the years. An ounce of prevention is worth a pound of cure, even when we are talking about iron fences. Wrought iron fences can undergo major damage whenever they are exposed to rain, heat, and humidity. 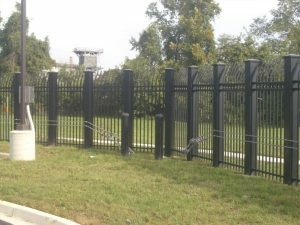 Northern Virginia is known for heat and humidity, so preventing your iron fence from rusting isn’t an option. Use protective wax or a special protective sealant designed for wrought iron fences to keep moisture out and protect your fence. It is much easier to do this from the moment that you get your iron fence than to deal with the damage from water in the future. Painting your fence doesn’t need to mean using lime green and hot pink to set your iron fence from others on the stress. In fact, it can be as simple as painting your wrought iron fence the exact same color that it is now. Black paint looks classic and serves as the perfect elegant compliment to your yard. Paint also serves the same function as wax or sealant, as it will stop water from getting onto the surface of your iron fence. Just like with any type of fence, it’s important to regularly inspect your iron fence. Since they are so vulnerable to rust, it’s crucial to catch the rust as quickly as possible before it spreads. Look for any loose or unstable footings, cracks, or additional damage. Did you paint your fence like we suggested above? Check for cracks, chips, or flakes in the paint. Always make repairs as quickly as possible to prevent your iron fence from undergoing further damage. This entry was posted on Friday, July 7th, 2017 at 4:34 pm. Both comments and pings are currently closed.